This Fleet Street institution was originally known as The Crown & Sugarloaf, but took on the name Punch thanks to its connection with the famous satirical magazine (and not, despite the sign, the notorious thug, Mr Punch). The now defunct Punch magazine – its name apparently comes from a comment at the first meeting of staff that a magazine should be like a good punch mixture – was apparently founded in 1841 at the Edinburgh Castle Tavern in the Strand, just up the road. Following its launch, the staff apparently began to meet at The Crown & Sugarloaf and it was this fact which apparently led the to the name change. While there has apparently been a pub here since the 17th century, in 1890s, the property at 99 Fleet Street was rebuilt and the pub, under the guidance of architects Saville and Martin, was transformed into a gin palace. Now located in a Grade II listed building, the pub has retained much of its original Victorian character – with etched mirrors, a marble bar, dark oak panelling, banquette seating and a series of original Punch and Judy paintings dating from 1897. 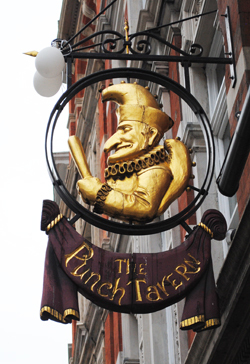 The pub is now owned by Punch Taverns – the company took its name from this famous pub. Incidentally, the name The Crown & Sugarloaf lives on just around the corner in Bride Lane – this small pub, which has a rather complicated history but is now part of the Samuel Smith chain, was once connected to the Punch Tavern.